TOKYO (AP) — Photo ops of SoftBank Chief Executive Masayoshi Son sometimes show him chatting happily with his company's humanoid robot, the childlike Pepper, or grinning as President Donald Trump heaps praise on him for creating American jobs. He is no "salaryman" president, those typical executives who rise gradually and quietly through the ranks, Japan-style, in a corporate culture that frowns upon mavericks and tends to squelch self-made ventures. Son stressed at a news conference Monday that his company was neither an old-style Japanese "zaibatsu," a business conglomerate with roots dating to the 19th century Meiji Era, nor a venture capital outfit pursuing a quick payback. 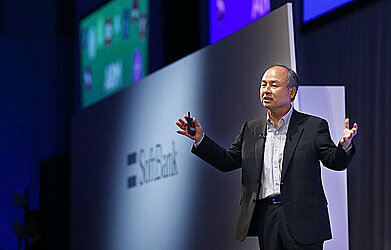 SoftBank tries to influence strategy in the businesses it invests in, without exerting outright control or overhauling their management, he said, instead collaborating on a shared vision of what he called the "information revolution." "We don't try to stamp our color on our group companies," he said. "We feel a brand should be free." "His goal is to become the No. 1 company in the world through expanding in the technology area," he said. "He has the ability to gather money and information. He can act, and he can make decisions." "Those who rule chips will rule the entire world. Those who rule data will rule the entire world." Son said. "That's what people of the future will say." "What you don't want is an unprofitable company," said Miki. "And he has a passion, a dream."